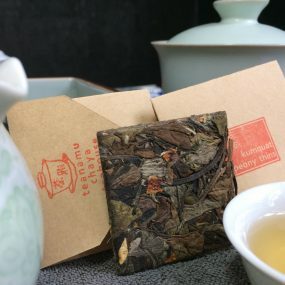 White tea traditionally grows in only three specific areas in northern Fujian province, though some is now produced in Anhui, Yunnan and Zhejiang. It rejoices in simplicity, with light infusions of sweet subtlety and flavour tones of honey, chestnut and peaches. For top grades only tender, unopened buds are used. Shaded for the three weeks before harvesting, the buds are plucked in early spring, over 10,000 buds per kilo for certain varieties. It’s said that, once upon a time, only virgins in white silk gloves could pick the buds. Certainly, conditions have to be immaculate, with perfectly dry and mild weather, the buds being neither too long nor too thin but exactly right for the exacting standards of the tea maker. Compared to green tea, where oxidation is completely prevented, white tea is actually less processed, although it is slightly oxidised. Traditionally, white tea is dried or withered in a pavilion, slightly shaded from the sun and with good air circulation. This natural process, called ‘fading’, develops the tea’s creaminess and the floral aromatics, and is ‘locked in’ by a gentle baking. After processing, the leaves reveal a covering of fine, downy white hair.